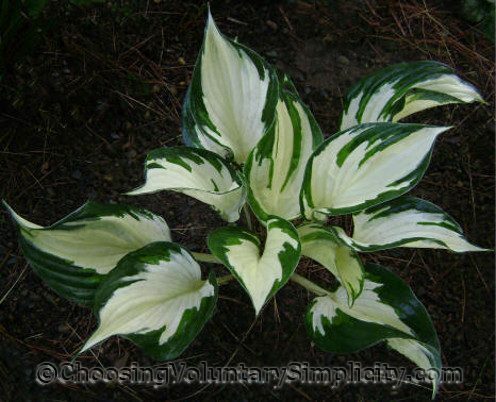 Despite its small size, Hosta ‘Fire and Ice’ really stands out and is easily recognizable even from a distance because its foliage shows such a sharp contrast between the white and the green. It has an upright shape and large twisted leaves that are thick and slightly folded, with snow-white centers and dark green margins. It is a sport of Patriot, the 1997 hosta of the year. Fire and Ice is one of the most striking hostas in my gardens. It is definitely one of my favorites and is special to me because it is one of several hostas one of my sons gave to me last summer. It really depends on the time of year you divide it and the amount of root system that it has. 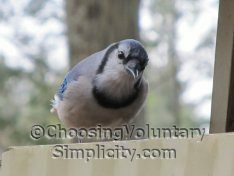 There seems to be some difference of opinion as to what time of year is best for dividing… but many people think it is easier to do in the spring… although others think it is easier on the hosta if they are divided in the fall. I have to admit I like to let the hostas grow until they reach a huge size, so if it were me, I would let your Fire and Ice hosta keep growing. 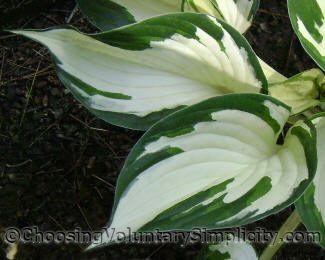 If you do decide to divide the hosta, it will need some time to look as good as it did before, especially if you have to do much cutting. I love the Fire and Ice. They sold this variety at our local Wal-Mart this year. I have several and they are a stand out. We purchased one Fire and Ice this spring and liked it so much we went searching for more. Our summer — hot and very dry — has been hard on most of our hostas, but the young Fire and Ice are doing well. Katy N: I picked mine up just today at same store-can’t beat their price anywhere! The plant has 3 crowns too! whoohoo!